In this tutorial, learn how to add embossing to your greeting cards without making a large investment in special tools. Embossing, a raised surface design, adds a subtle finishing touch that makes your handmade card truly unique. An embossed card is bound to be appreciated for its elegance. This greeting card tutorial builds on previous tutorials, especially #1: Four Patch Cards and #2: Matted Clip-art and Photo Cards. 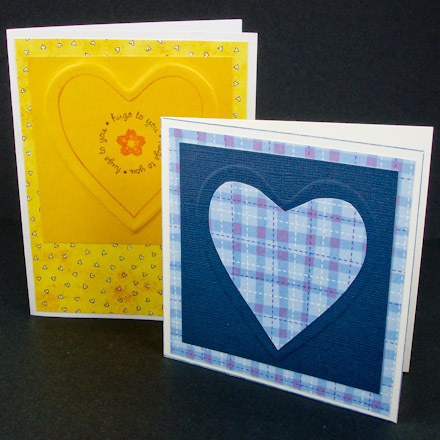 If you are new to card making, review these tutorials before starting this one. 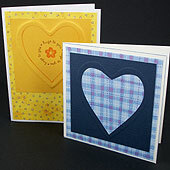 This tutorial is 7th of twelve card making tutorials and is rated AVERAGE to do. To make the card in this tutorial, select a solid color of cardstock and a coordinating decorative paper. The embossing will be done on the cardstock. 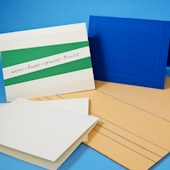 A sure bet is to select cardstock and paper in the same basic color. 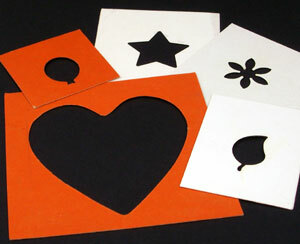 For more dynamic color combinations refer to the color wheel concepts in the Paper Weaving Card Tutorial. Cut a 4" square of cardboard—cardboard from an empty cereal box or poster board works well. 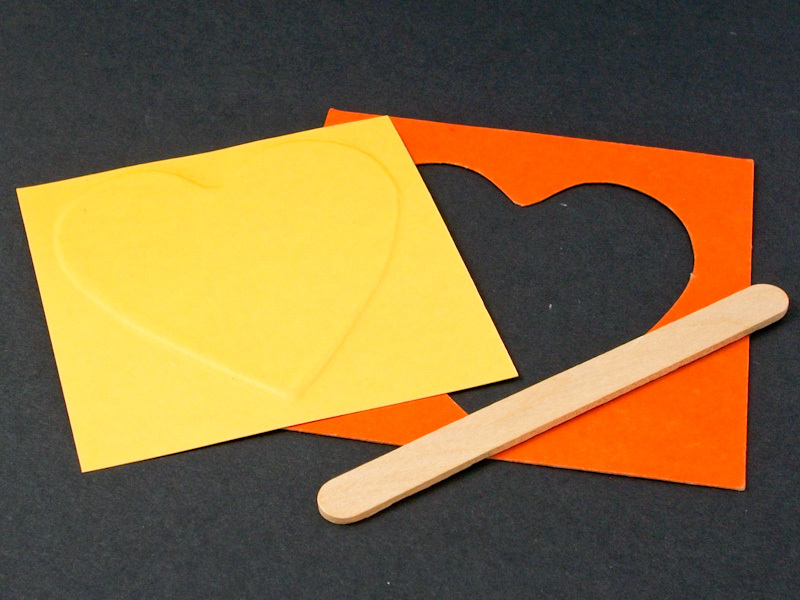 Draw a 3" heart in the center of the cardboard square and cut it out using scissors or a craft knife. 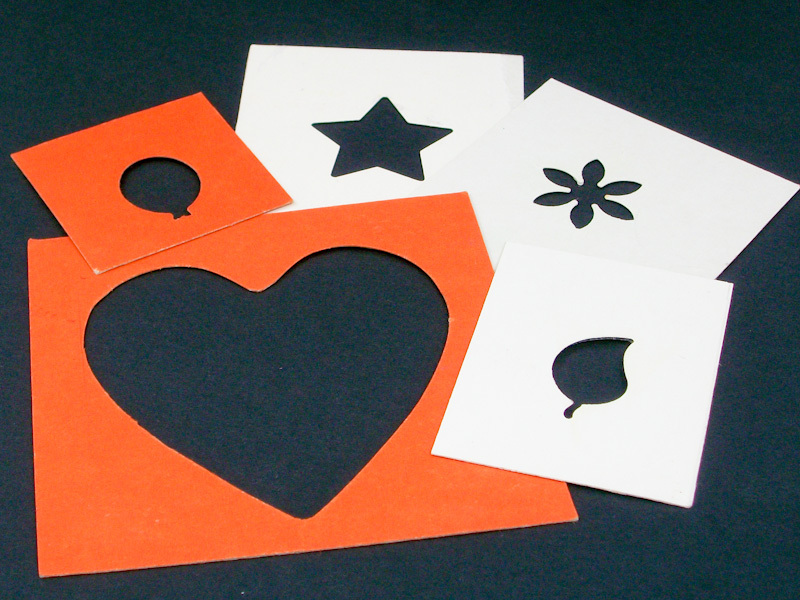 Tip: Embossing templates can also be made with a paper punch. Be sure that the cardboard isn't too heavy to be punched. 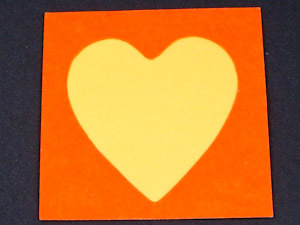 Cut a 5¼" by 4" piece of decorative paper to use as the card's background. Cut a 3½" square from the solid color cardstock to emboss. Center the embossing template over the the cardstock square, front side up. While holding firmly, flip the two over. 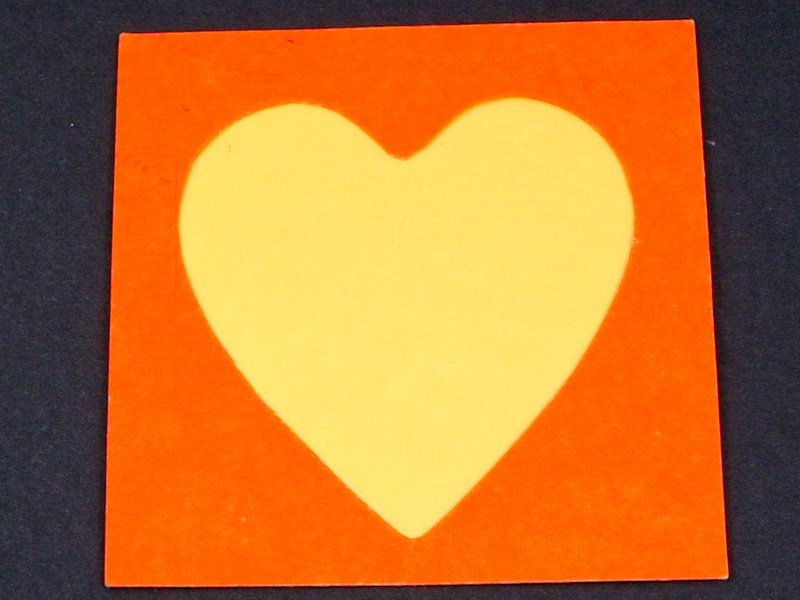 Tip: Hold the template and cardstock in front of a light to check that the paper is centered on the heart. We are doing a type of dry embossing called blind embossing. It's called blind because the embossing template is hidden from view. 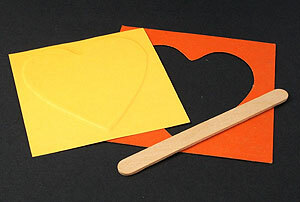 Hold the cardstock and template firmly with one hand and the craft stick in the other hand. With a couple of fingers from the hand holding the craft stick, gently feel for the edge of the heart. Run the tip of the craft stick along the edge, all the way around. Flatten the craft stick and retrace the edge, pushing firmly to get a sharp impression. 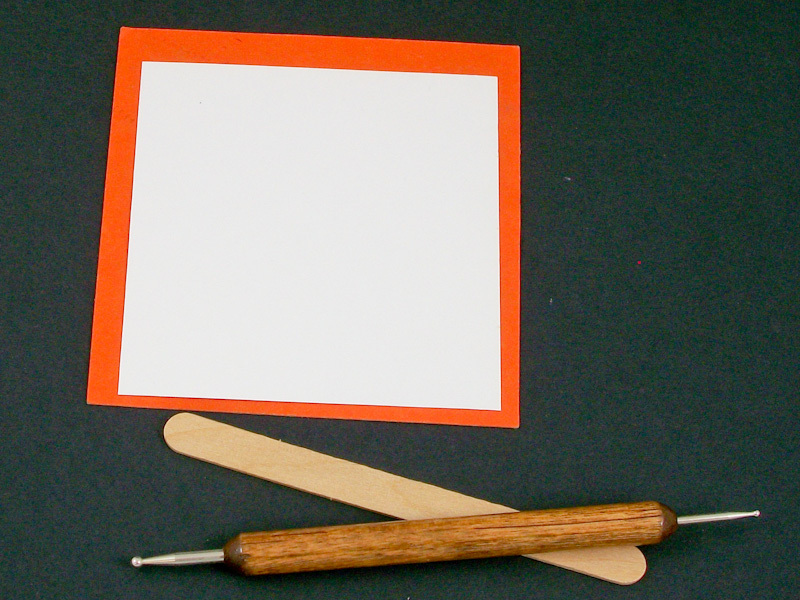 You may first want to practice the embossing on some scrap cardstock. Tip: The cardstock can easily slip out of place. You may want to lightly tape it to prevent slipping. 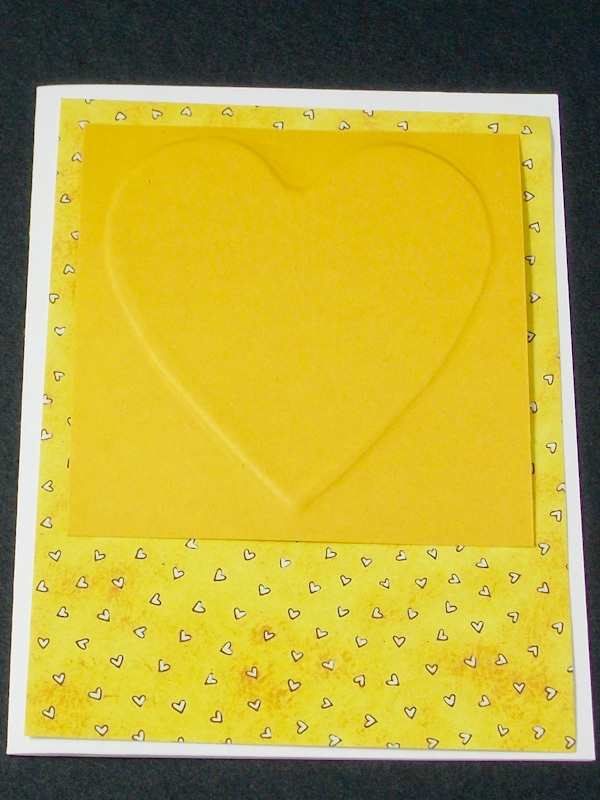 Turn the cardstock over to reveal the embossed heart. If there are any gaps in the embossing, carefully realign the template and repeat the embossing. 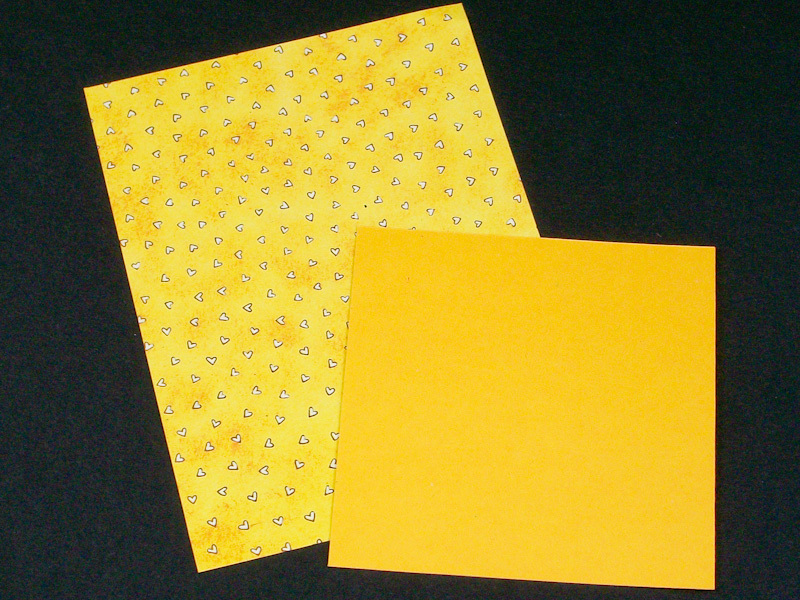 Tip: It is possible on some types of cardstock to correct problems. 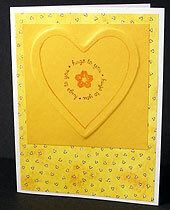 Use the flat of the craft stick to press out problems in the embossing and redo the embossing. 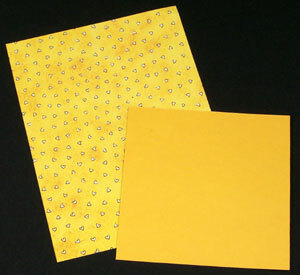 Glue the decorative paper background to the card and glue the embossed cardstock square on top. Embossing is a very subtle design element best viewed close-up. 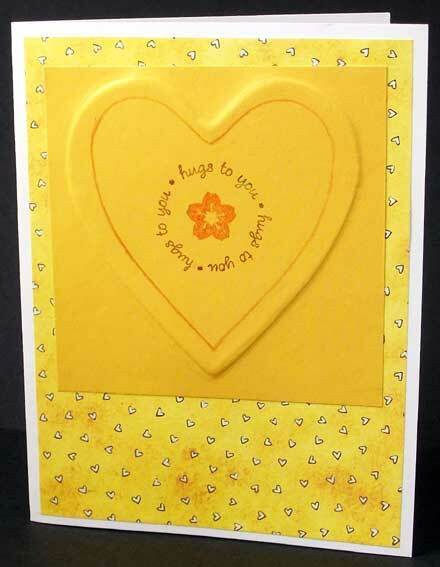 To enhance the card for viewing across a room, add more embellishments with colored pencils or rubber stamps. 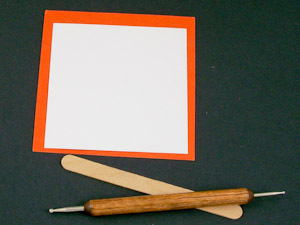 Tip: It's easy to add embossed lines, borders and grids to your greeting cards with a DIY Scoring and Embossing Board. Make one for yourself or to give as a gift. It can be customized with scoring grooves spaced to exactly fit your need. Tip: Use Aunt Annie's coordinating Happy Birthday and Balloons and Gifts ePapers to make embossed greeting cards or other card. Tip: Cards made with a paper punch embossing template can be further enhanced by adding paper punches in similar and contrasting colors. 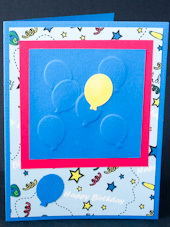 This card uses Aunt Annie's Balloons and Gifts on Blue ePaper. Tip: An embossed card will have more impact with some additional elements. 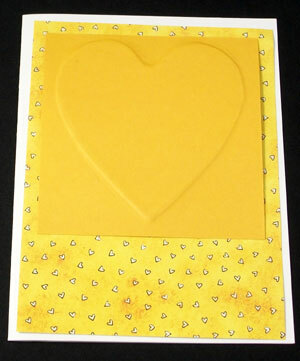 This card has a heart traced in colored pencil and a stamped image in the center of the embossing.